For those of us who moved to Duluth after 1980, the Duluth Public Library has always been that long, ore boat-like structure across from the Radisson—a sprawling modern building that blocks the view of the historic Union Depot. But for eighty years Duluthians read and researched in a neo-classical building made of brownstone that, while cramped almost from the start, holds a special place in the hearts of those lucky enough to call the Zenith City home while it still served Duluth’s citizens. 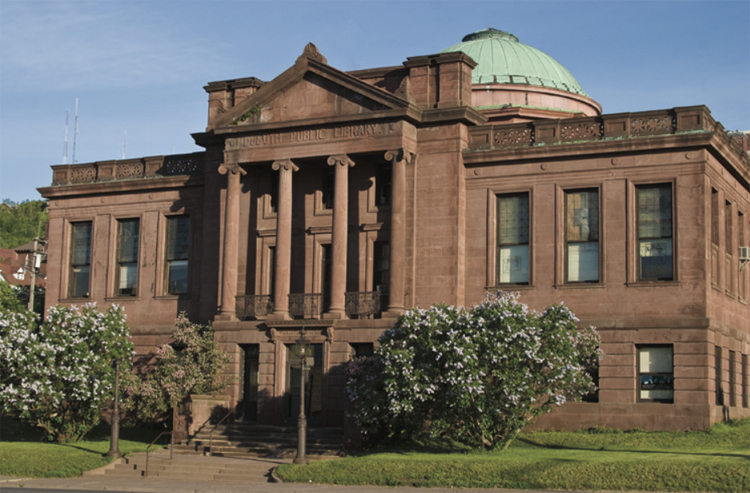 That building, the 1902 Duluth Public Library (aka the “Carnegie Library”) is also one of the grandest old buildings still standing in the city. The 1902 library building was the second official home of the Duluth Public Library, which was established in 1889. Prior to that, Duluthians had taken it upon themselves to bring literature to the community. In 1869—a year before Duluth would become a city—local leaders formed the Duluth Library Association. Its roster of officers and board members read like a Who’s Who of early Duluthians: Luther Mendenhall, J. J. Egan, George C. Stone, George Sargent, Luke Marvin, and others. The Library Association moved into the second floor of a building owned by Colonel C. H. Graves, located “on Superior Street, opposite the Clark House,” essentially on the lower half of the West 100 block of Superior Street. When it first opened December 1, 1869, the Association’s rooms were carpeted and “the walls [were] hung with evergreen wreaths and handsome pictures.” More importantly, its collection already contained 500 volumes, half of which were donated by Frank H. and J. Clark of Philadelphia. The Clarks were the sons of Enoch W. Clark, Jay Cooke’s mentor and namesake of the Clark House; in fact many of the Library Association’s first members had close ties to Cooke. The following year Reverend C. C. Salter attempted to organize the Duluth Free Reading Room and Library Association, but the idea was complicated by its connection to starting a YMCA at the same time. Possibly frustrated by the pace Salter’s idea getting off the ground, the wives of Duluth’s power brokers met on November 17, 1882, and established the Ladies’ Library Association. They included Caroline Ray, wife of J. D., and Ida Spencer, wife of George, who donated space in the building he owned with Melvin Forbes, the Metropolitan Block at 113–119 West Superior Street. Forbes and Spencer were part of Duluth’s burgeoning grain trade, investing in grain elevators just like their friends Roger Munger and Clinton Markell. In 1883 Munger and Markell built the Grand Opera House at 333 West Superior Street. When the Opera House opened, the Ladies’ Library Association moved into some rooms on one of its upper floors. That home lasted until January 28, 1889, when the Opera House and all its contents were consumed by fire. The Association was left with a check from an insurance company for $500—and nothing else. Meanwhile, Duluth had regained its status as a city in 1887. Instead of rebuilding, the Ladies’ Library Association petitioned the City Council to establish a public library and donated its $500 to jumpstart the library’s funding. In 1890, under Mayor Sutphin, Duluth’s Library Board was established with George Spencer as its first president. Other board members included J. D. Ensign, historian Dwight Woodbridge, and Catholic Bishop James McGolrick. The board purchased 200 books and hired Olin S. David of Topeka, Kansas, as head librarian. Meanwhile Duluth’s masons had constructed the Temple Opera Block and Temple Opera House, which took the place of the Grand Opera House. In August, 1890, the Duluth Public Library opened on the second floor of the Temple Opera Block—and soon patrons were calling for better facilities: the lighting and ventilation were poor. By 1893 it was considered overcrowded, and the Library began expanding to the third and fourth floors. That same year St. Louis County donated the “Minnehaha Window”—a Tiffany window designed by Duluthian Ann Weston to represent Duluth and St. Louis County at the 1892 World’s Exposition in Chicago—to the public library and the window was hung in one of the library’s rooms in the Temple Opera Block. The Temple Opera House burned in 1895, but a firewall saved the Temple Opera Block—and the Duluth Public Library. But soon both the Masons and the library board were considering new homes. A site for the library at the northwest corner of Second Street and First Avenue West was chosen because it was close to Central High School. For funding they did the same thing communities across the country were doing at the time: they asked industrialist Andrew Carnegie for money. Carnegie came through with $50,000. The board struggled to choose a design for the building. It came down to two, one by the firm of Radcliffe and Willoughby and another by Adolph Rudolph. The Radcliffe and Willoughby was smaller, but it had the advantage of an estimated cost of $50,000—the same as Carnegie’s gift. But the Library Board soon became convinced that the plans were too small, and they feared the city would quickly outgrow the facility. So they requested another $25,000 from Carnegie, who once again came through with the cash.